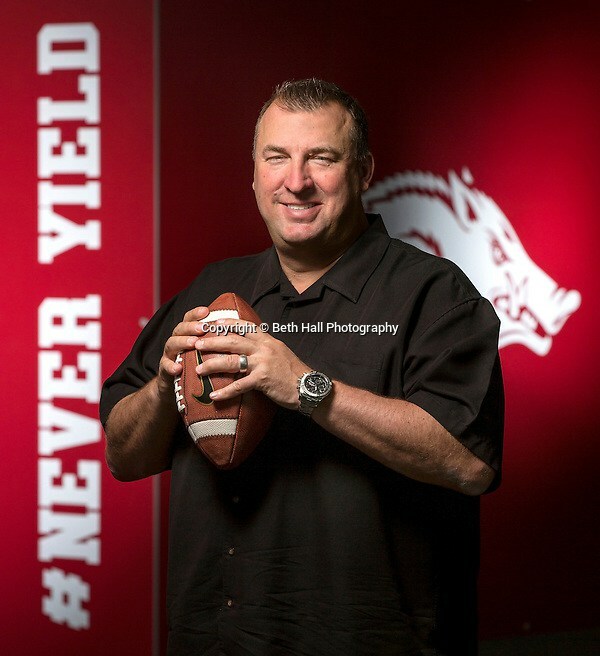 In May, I photographed Arkansas Razorback head football coach Bret Bielema for AY Magazine’s powerful men. Environmental photographs are always fun because I get the chance to make the ideas in my head come to life. When I was contacted about the assignment, I knew I wanted to show him with “Never Yield,” a slogan that was coined when he first started coaching at Arkansas. My problem was finding a place with those words. During a scouting trip, I found the words, and hog, on a bright red column in the new football center. I had a few days to think about how I wanted to utilize those words, and on the day of the shoot I was lucky enough that my friend, and wedding photographer Sarah Bentham, was able to stand in as I set up my lights! Life is always easier with an assistant. Time goes by quickly. This is my fourth head coach to photograph, and this year will be my 14th season to photograph the hogs.